Since we posted last time we have played 2 gigs – the first at Danfest2 in Leicester and then a special gig in December at the Barbican in London. The contrast between the 2 venues/shows could hardly have been greater – but suffice to say plenty of fun was had at both of them. For those that made it – thank you very much for coming along and supporting us. We were particularly pleased to see Jane Mann at Leicester and delighted that she was able to join Andy, Clive and Brian for a post-gig curry! After the Barbican show even more of you were able to join us for the after-show party (which went on until 2am and yes, there was dancing)… and it was lovely to see so many old and dear friends. Amanda, Kate, and Taff – just to name a few. ‘And so it was with very mixed emotions that we closed another chapter in our long and varied history last week at the Barbican in London. It was a very special night and we would like to say a HUGE thank you to everyone who came along and supported us, and to everyone who helped ‘behind the scenes’ to make it happen. For those of you who came along we hope you enjoyed it too. We were also delighted and amazed to discover that over 800 watched the webcast live – including fans as far away as Australia and the United States…’ As Clive has said on Facebook ‘thank you to all of you who have seen or heard us over the last 30 years or so… the Barbican was a fantastic evening and I couldn’t have wished for a better way to say goodbye’. Please continue to send us your photos and any video footage you have, as we would like to include as much as possible in a future DVD release. Here’s a link to a set of photos from Trevor Cotterell, who has been a fan since the Target days! www.cpp.tclh.co.uk/twelfthnight/12DecLondon/large/scroll.htm – Thanks Trevor! 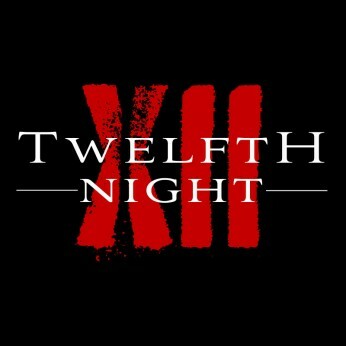 Looking forward to 2013, Twelfth Night HQ remains busy. We have several CD and DVD projects in the pipeline over the next few months, including some unreleased Twelfth Night music from 1979-80, a definitive “Fact and Fiction” reissue, the DVD release of Live and let Live, Andy Sears’ long-awaited solo album, an update to Play On (our official biography) and, we hope, a CD/DVD of last Saturday’s show. Despite the absence of ‘TN’ shows there are already several musical adventures planned involving different members of the ‘TN’ family. Andy Sears is performing in Clive Nolan’s latest musical ‘Alchemy’ in February, Clive and Mark will be appearing at Celebr8.2 in the Spring, and Mark and Dean will be touring with Galahad, who have a number of international dates in 2013. We will keep you informed via the web-site (which is itself about to undergo an ‘awesome’ revamp – thanks Mark! ), Facebook, and Night Moves.